In a bowl, mix together the flour and salt. Add the chilled shortening pieces and mix into the flour mixture using fingers, can also use a pastry blender or two knifes. Using fingers, lightly mix in the warm water a little at a time until the mixtures forms into a ball and isn't sticky anymore. Wrap dough ball in plastic wrap and chill in the refrigerator for at least 30 minutes. Place the olive oil in a large skillet over medium-high heat and once oil is hot, add the onion, bell pepper and garlic. Sauté for 5 minutes. Add the ground meat to the skillet, stir well and continue cooking until beef is browned and fully cooked, about another 5 minutes. Add the sliced olives, tomato sauce, sherry, Worcestershire sauce, Tabasco, cumin, and dried oregano. Stir well so all ingredients are combined, cover pan and lower heat. Simmer for about 20 minutes. Set aside and let cool before filling the empanadas. Heat the oil in a large frying pot or deep fryer to 365F degrees. Remove dough ball from refrigerator and separate into 10 equal sized balls. On a lightly floured surface, roll out each dough ball into a thin circle. Place a few tablespoons of the picadillo onto the center and fold half of the dough over, sealing the edges by pressing down with a fork or twisting the edges over to form a seal. Gently place 1-2 empanadas at a time in the hot oil (do not crowd) and cook until brown on each side, about 3 minutes per side. Remove from oil and let drain on wire rack. Repeat with remaining empanadas. Serve warm with lots of chimichurri on the side. 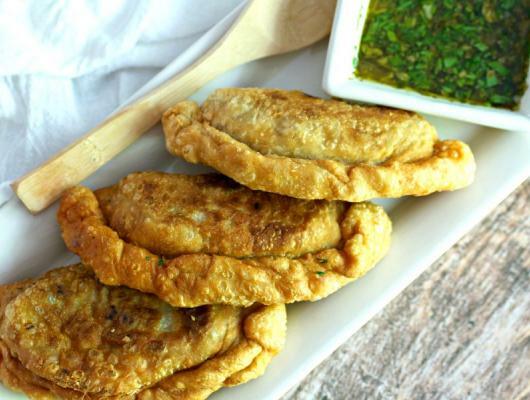 Cooked empanadas can be frozen in a freezer proof bag or plastic container for up to 3 months. Let fully thaw before reheating in a 325F oven for 5 minutes. Enjoy! 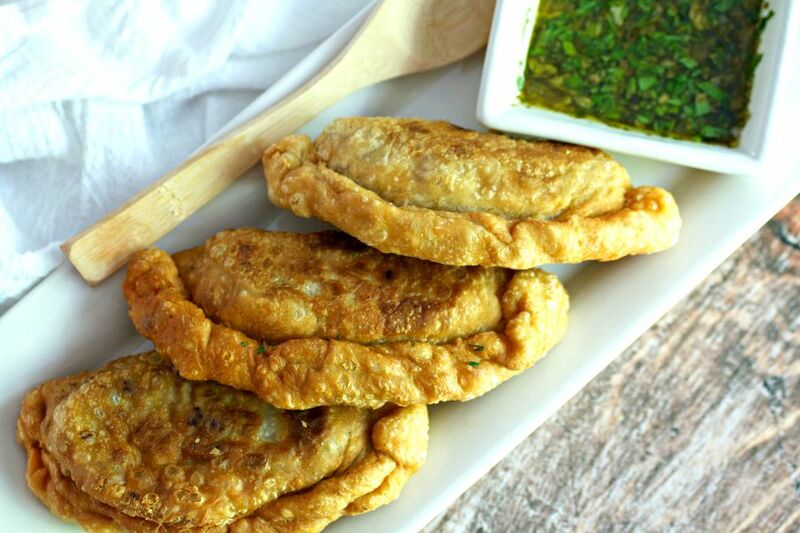 Easy and delicious fried hand pies with a picadillo filling and a flaky crust. Homemade dough recipe included!